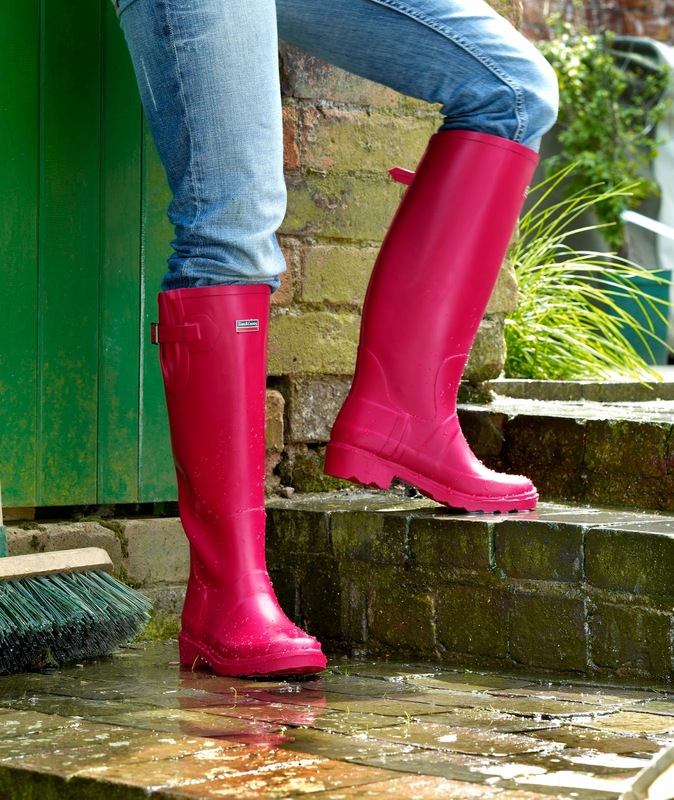 Sales of wellies have soared in the last few months and if, like many, you are bewildered by the choice and the price tags on display - ranging from £10 for a basic boot to upwards of £300 for a designer brand, we have some good news for you. You don’t need to spend a fortune to get a decent quality, good looking pair that will see you through the wet weather. In a recent tried and tested review undertaken by the Daily Mail, Town & Country’s Premium Wellington – at just £45.99 – were rated on a par with Hunter (£95) and Le Chameau (£340) – with all three scoring an impressive 7/10. In celebration of the beginning of the summer holidays and finally seeing some sun I have decided to do an 'Inspired' post this week. I've always loved playhouses and after having three daughters that all LOVE playing outside and getting dirty I'm currently longing for an awesome playhouse for them to spend more time outside come rain or shine. I know this isn't something 99% of the population can afford, never mind fit into their suburban garden but Oh My Lord it's the most amazing structure I've ever laid eyes on. This one reminds me of all the Enid Blyton books I read as a child. 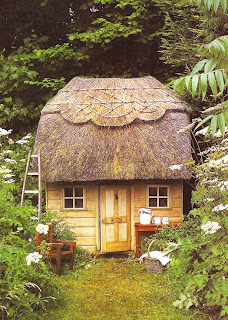 It has a thatched roof, which as a grown-up I know it is impractical yet I still want! The size and shape is more fitting to a UK suburban garden, if not made from totally the wrong materials for our climate, but I'm sure you can all take inspiration from this and build something amazing for your children! Now the obvious course of action here is to follow on to games you can play in your garden, and I don't mean tennis or football but indoor games... MEGA sized for the garden. The possibilities are- of course- endless and I'm sure the children would enjoy painting the spots on as much as playing the game with their friends and family. The special garden games spray paints are available from garden centres and don't damage the grass. Instead you could cut out fabric or card spots and simply lay them on the grass, or you could chalk the spots onto the patio. Another family favourite is Jenga and what garden should be without a giant-sized version? Of course you don't need to buy one this enormous! Argos and other retailers sell a garden version for not very much money but you could always- if you're crafty- make your own. There are many, many others, such as chess and draughts which are also great for garden fun and simple enough for children to understand and take part. I'm a sucker for pretty things whether clothing, homewares or gorgeous things in your garden and the following pics are no exception! Maybe one day I'll get it looking like this! I love arches and this is totally beyond belief! 'The Secret Garden' is an amazing book and inspiration just flows from it. 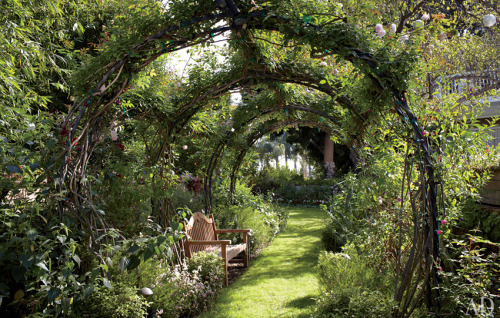 This would be an amazing entrance to any garden, secret or otherwise! The possibilities are endless in regard to what you have climbing up and over your own archway. There are plenty of frames or shaped metalwork out there to achieve a fabulous shape for any archway. I love our garden at night, you can't see the neighbours and we get a great view on the sky but my trouble has always been making somewhere amazing to sit and spend an evening. I long to create a space like this and it's easy and low cost to do. 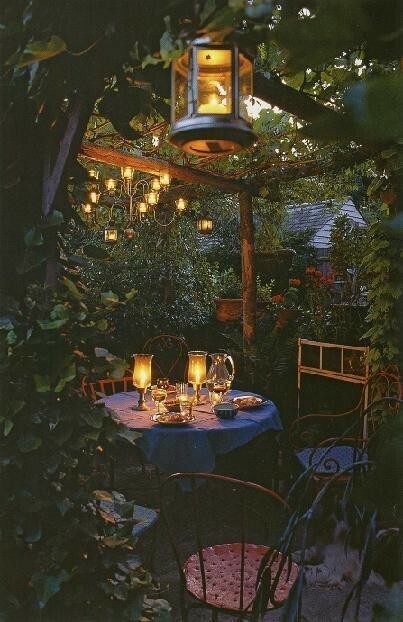 Most importantly, you need trees or a structure to sit beneath for your hanging lanterns, etc. I challenge you this summer break to create something amazing yet family friendly for your garden, ours is in progress!